It was an honor to design the poster, website, and opening title sequence for this Academy Award nominated documentary. The Barber of Birmingham was co-directed by my mom, Gail Dolgin (1945-2010). During the final days of her battle with breast cancer, she made the decision to turn her feature film into a short. I then joined co-director Robin Fryday, along with the members of my mom’s documentary film community, in the considerable effort it took to complete the film. To our amazement, the film was accepted to Sundance, paving its way to the Oscars. The story follows the life of Mr. James Armstrong. 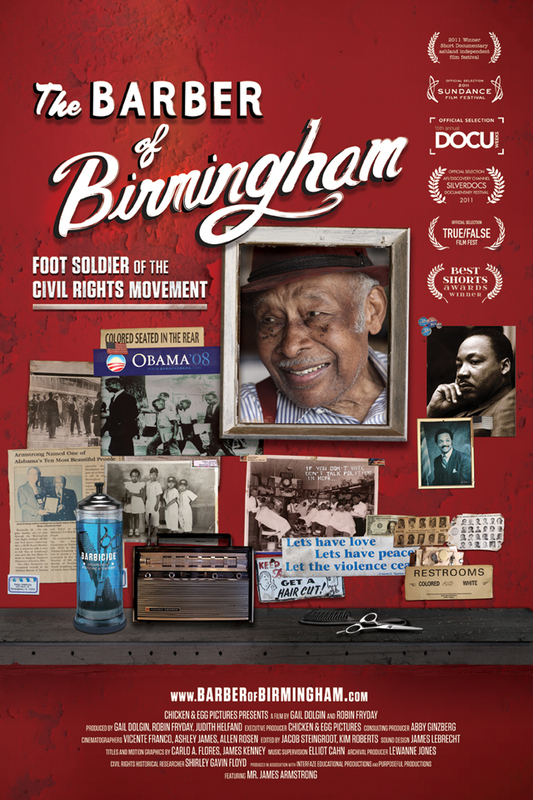 He was the proud proprietor of Armstrong’s Barbershop, a cultural and political hub in Birmingham, Alabama, and a foot soldier of the Civil Rights Movement. We witness 85-year-old Mr. Armstrong as he recalls his life’s work and experiences the election of the first African American president. Mr. Armstrong’s shop walls are covered with ephemera from the Civil Rights Movement, inspiring the design of the poster. The title treatment pays tribute to the hand-painted sign that graces his shop window.